The Model AU-3C has most of the same features and options as the Model AU-6C except that it requires only 45 inches x 65 inches of floor space. It is the smallest fully automatic unscrambler with built in cleaner in the industry--handling a wide range of containers with little or no parts, no air and has a low profile (the maximum height is 60 inches). Virtually all styles and shapes of plastic, metal and corrugated containers can be handled in the range of 1/2 inch to 6 inches tall and up to 3 inches wide. A wide range of speeds can be obtained depending upon container size. Compact Design less than 7’ x 4’ foot print (only 6 ft. of line space required). 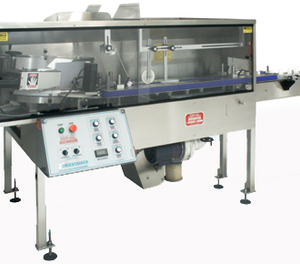 Low profile 30” diameter stainless steel pre-feeder. Air Ionizer Cleaner with vacuum and Ionizing Monitor. Exclusive patent pending design eliminating numerous change parts. Fully adjustable orienting mechanism to handle a wide range of containers. Minimal to no changeover parts needed for a wide range of plastic round, square, rectangular, and oval containers from 3/4” to 3” wide and 1 1/2” tall up to 6” tall. Heavy duty welded construction frame. Electronic variable speed controls for all orienting functions. Non-marring contact parts for pre-feeder, orienting mechanism and discharge exit. Can be used with existing conveyor or with an optional stainless steel Feed Systems conveyor listed below. No air required for most applications. Stainless steel and Lexan covers and guards throughout allowing for wide access for easy adjustments. Computer designed for a quiet, smooth, dependable operation. Left to right conveyor discharge is standard. Complete with 10 cubic foot stainless steel floor level bottle supply hopper and elevator complete with cleanout door for easy unloading. Hopper upgrades up to 20 cubic foot. Casters option for portable needs.